Considering the volume and diversity of information flowing from different sources it's easy to presume that a person is being sort of oppressed by it. 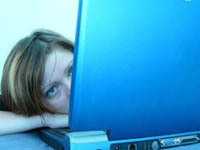 Thus people who spend a lot of time surfing the internet are prone to depression, British scientists said on Wednesday. But it is not clear whether the internet causes depression or whether depressed people are drawn to it. Psychologists found what they said was "striking" evidence that some avid net users develop compulsive internet habits in which they replace real-life social interaction with online chat rooms and social networking sites. "This study reinforces the public speculation that over-engaging in websites ... might be linked to psychological disorders like depression and addiction," the study's lead author, Catriona Morrison, wrote in the journal Psychopathology. For the study the researchers analyzed internet use and depression levels of 1,319 Britons aged between 16 and 51. She suspects that for a small subset of people, excessive use of the internet could be a warning signal for depressive tendencies.